When clients call the University of Georgia Cooperative Extension office for help because their lawn is thinning out or has dead patches, the first thing I recommend is a soil test. A routine soil test will help reveal any underlying issues relating to soil nutrition or pH. This is often the first step to ruling out any problems with the overall health of a lawn. Lawns that are stressed due to nutrient deficiency are more susceptible to lawn diseases and less tolerant of insects. Many lawn care companies do not test soil and often prescribe the same fertilizers – with mostly nitrogen – to all lawns on a routine schedule. They may have no clue if they are applying the right type of fertilizer to meet the nutritional needs of the lawn. After testing the soil, the next step to finding a solution is submitting a turfgrass sample to troubleshoot for plant disease or insect issues. In some cases, a disease may be the primary cause of poor lawn health. It’s very difficult to get an accurate, on-site diagnosis of a disease without using a microscope. 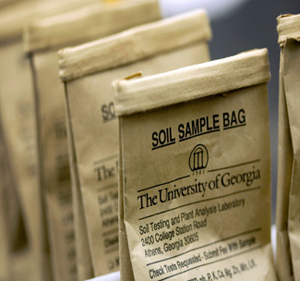 Clients that are anxious for a solution will often submit a turfgrass sample when they submit a soil sample to their local UGA Extension office. More often than not, the turfgrass sample is inconclusive and may not reveal any obvious disease problems associated with the dead patches. If we look hard enough at any stressed turfgrass, we’re likely to find a few secondary disease pathogens that are taking advantage of the dead or dying grass. However, the real problem is often environmental stress from poor drainage, overwatering, poor fertility, soil compaction or improper maintenance practices. The No. 1 problem I’ve seen through recent soil tests for lawns is a lack of phosphorus. This is an essential plant nutrient for root development, new lawn establishment and overall plant health. When there is a lack of phosphorus, the roots are poorly developed and the plant is unable to take up the other essential nutrients. Poorly developed, shallow root systems are unable to extract water from deep in the soil during dry spells and are less likely to be drought-resilient. Also, the roots are less cold-tolerant during abnormally harsh winters and less likely to recover from winter injury. Over time, the lawn slowly thins out and dies due to its inability to extract water and other nutrients essential for growth from the soil. Lawns that are given mostly nitrogen fertilizer will quickly green up after each application and appear to be healthy for a while. But, without the other essential nutrients, such as phosphorus and potassium, the lawn will eventually thin out and die from malnutrition. If you use a lawn care service, always ask whether or not they regularly test the soil as part of the service. If they do, they should provide a copy of the soil test results to the homeowner. Otherwise, it’s not clear whether they are fertilizing your lawn correctly. If the lawn care company does not provide soil testing, take a soil sample from the lawn for testing every few years to make sure fertilizer is being applied effectively. Soil test results through UGA are usually ready in about a week and can be delivered via regular mail or e-mail. For more information, contact your local UGA Extension office at 1-800-ASK-UGA1. For more on lawn care in Georgia, see UGA Extension publications at extension.uga.edu/publications or go to www.GeorgiaTurf.com.